The NAI Standard and Heavy Duty Augers are ideal for easily creating the hole you need for your next job, whether it is putting up a fence, planting trees or shrubs, or adding a deck to your house. 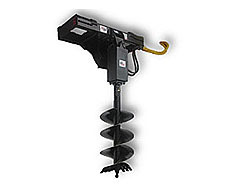 Eat through frozen ground, tree roots, sticky clay, or rocky soil with the NAI Auger. With a variety of bits available, just about any size hole can be created with our Augers.